24hrs or less to live. Gotta make the most of it! 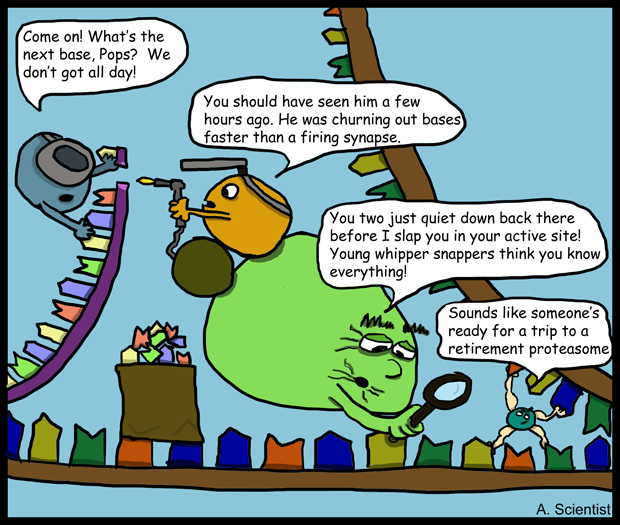 Retirement proteasome, two words I never thought I'd hear together! 'slap you in your active site' really cracked me up!Good stuff. Maybe you could do another story, a darker more sinister 'marked for death' by ubiquitination. I actually had a grim reaper with a Ub gun in there, but it looked too cluttered. Maybe there'll be a sequel... Although, I still have the "shrink ray" series to finish. So many ideas, so little time to draw! You could start up a business making cartoons to summarise the key findings in scientific papers, that would make them so much more fun to read!